Inspired by the ladies behind Words of Encouragement. So, this post is a little different from what I have posted before, but I feel like it is necessary. 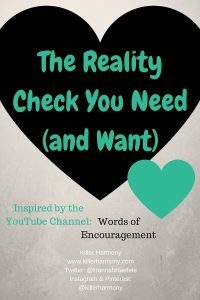 The reality check you need to hear is this: you are worth it. The things you are doing in school, in work, in life are all worth your time, money, and you, my friend, are headed for greatness. Whether you are in high school, college, or you are out in the working world, you are important. Your happiness is important. I currently blog about music and life as a college music major, but this advice can be applied to anyone who might be doubting the choices they have made. It’s okay to transfer universities. I did it. Twice. It’s okay to quit the job you hate to pursue something you love. If this is your first encounter with my blog, hi, I’m Hannah, and nice to meet you. I am currently studying flute performance at a small state school in the middle of the country. Had I not transferred to said school, I would be at a larger public university, studying Spanish. It’s not the worst idea in the world, but it wasn’t my first choice. I didn’t really have any idea what I would do with that degree once I graduated. I made a change to better my life and to make me happy. Now is the time of year where high school juniors are beginning to think seriously about college and going on visits, high school seniors are looking at colleges or maybe jobs. College seniors are looking at jobs or graduate school…or both. This time of year brings the need for many decisions to be made. Think about what you really want to do, to study, to spend the bulk of your life pursuing. Choose that route. It might not be the “safe” choice, but if it is what you really want, you can make the sacrifices for your choice to be successful. I chose music performance (rather than education), because I knew in my heart that I would not be the right fit for a job teaching band or choir in a classroom setting. I would prefer to teach privately or in small groups and to teach the areas of music that I had a great interest in. I may not even want a career in teaching. I’m considering all of my options so that I can prepare myself for my best, and happiest life. You should too. Hey friends! If you have not read the first part of this review series, check it out here! 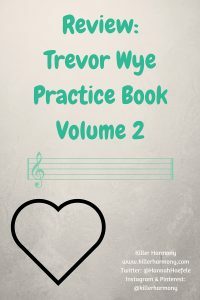 Today is the second installment of my series of reviews of Trevor Wye’s Practice Books for the Flute. As you can probably tell by now, it is not a weekly series, more like monthly. I have been working with the second book a little more lately, and so I thought now would be the perfect time to review it. The second volume, titled Technique is just that: a book of exercises to help your technique. It is full of scale patterns similar to those by Taffanel and Gaubert: two other big flute writers. I first started working on it just this semester after I purchased the Omnibus Edition of Volumes I-V over winter break. The book has scale patterns in a couple of different formats. First it has scale patterns in major that repeat chromatically going up through the range of the flute. This first part of exercises in the book look like one long exercise. Then these exercises are redone in minor. The second way that the exercises are formatted is in single measure chunks with repeat signs. In both cases, there are two patterns: one that starts on the tonic of the current key and one that, as a transition to the next note, starts on the leading tone. Both formats have multiple pattern variants, and both are in major and minor keys. The point of the technique book is to improve your technique, but I also like to use it as a continuation of my tone practice. As a serious flutist, I would like to be as good as I possibly can at the flute and its auxiliaries. I have learned that we not only need good tone when playing long notes, but also when playing shorter notes and moving around the instrument. Tone and Technique should work together as the basis for one’s musical practice and musical building blocks. As I stated above, I have the Omnibus Edition of the Trevor Wye Practice books, that way I have all five together, and I don’t have to worry about losing one or another. Currently, this edition is about $45 on Amazon, but that is less than if you bought all five book separately for an average of $15 per book. So, even though I don’t have a huge audience, and even though I have yet to receive questions about me or this blog or my life, I thought I would write a post interviewing myself about things that are relevant to me and my blog. I hope you like it or find interesting! Q: When and why did you start this blog? A: Well, this was not actually my first blog. I had another one that is not up anymore, and I wanted a blog that could be more broad. I started this blog under the name It’s Mixed Arts. I came up with that name a long time ago. It was my then-current email account name, and I was interested in blogging about more than just music. I have since realized that music and life as a music major should be the sole focus of my blog. I changed the name to Killer Harmony in January 2016. I plan on blogging for a long time, but my schedule might not always allow me to post twice a week. I hope to continue at least once a week. Twice when I can. Q: What exactly is your major? Q: What are your school’s requirements for a music major? Are they standard? A: I am required to take four semesters of music theory and ear training and sight singing classes. I would have had to take four semesters of group piano, but I passed out of all four semesters. I also have to take lessons each semester and perform in both large and small ensembles each semester. I have to take marching bad in the fall. I take wind ensemble all year and flute choir all year. I also will be taking basic conducting this fall. As a performance major, I must complete a junior and a senior recital. Then there is a whole list of general education courses. My university is accredited by the NASM, so I would say the requirements are standard. Q: Do you play anything besides flute? A: I can also play some auxiliary flutes, such as piccolo, alto and bass flutes. I can work my way around recorder. I can also play piano, clarinet, saxophone, and a little oboe. Q: How much do you practice a day? A: It varies depending on my schedule. I try to get at least 1.5 hours on flute and 30-45 minutes on piano as those are the instruments I take lessons for. I don’t have time to practice much else. I also try and do some piccolo for 30 of not every day, every other day. Sometimes, I will have been able to play for 3+ hours of flute per day. It really depends. Q: Do you live on or off campus? A: I live on campus in an upperclassman single dorm. I like the convenience, but the size of my university doesn’t lend itself to the best of options when it comes to on campus food. I’m a picky eater, so I would love if I could cook my own food instead of having to eat at the cafeteria. I will probably get an apartment in the next couple of years, though. Q: Do you drive in your college town? A: I don’t really find it necessary. I can walk to the pharmacy and grocery stores easily, and I have friends who could give me a ride if I needed to go farther. I might bring my car down in the future, but right now, I don’t miss it. Q: What are your post college plans? A: I would love to start teaching lessons privately, possibly in my college town. I am considering a graduate degree in music from my same university. Since I transferred from a community college, I would like to stay at my school for another couple years for a fuller experience. Q: What do you see happening with this blog as part of your future? A: right now, the only time that I have enough time to devote to blogging is during school breaks and during the weekends. I am on spring break pre-writing content for the rest of the semester, and depending on things, I might be cutting back to one post per week instead of two. I’m not sure for how long, but I want to create high quality content rather than high quantity. Well, there you have it. Some questions and answers about me, my life, and my blog. I hope you enjoyed it! I am working on more to come! Now that we are coming up on spring time, a lot of high school seniors are narrowing down their list of where they want to go to college. Graduation is getting closer and the reality of having to pick a college to go to is upon you. Maybe you’re not ready to pick the place where you will spend the next four years of your life. Maybe you don’t have any idea what to study. Maybe you don’t even know if college is for you. That’s totally and completely okay. If you are worried about financing your post-secondary education, you are not alone. Many students have that same worry. College costs are rising, and community college is a good option, at least for the first two years of a degree. Here, I am going to explain, in as much detail as I can, why you should at least consider community college. Who doesn’t love money? Plus, if you are in the group of people who have the burden of paying for college entirely on your own-for which I feel bad-the more money you save, the better. Tuition is much cheaper at a community college than at even the cheapest four year university. You also don’t have to account as much for room and board. Your parents may charge rent, but no way would it be more than room and board at a university. Plus, with the flexibility offered at community colleges, it is much easier to work a part time job. 2. You don’t have to fit the stereotypical mold of who goes to community college. One of the greatest things about community college is that you are in class with people from all walks of life. People of all age ranges, academic backgrounds, socioeconomic statuses, etc. will be found at a community college-yes, even people who are considered traditional college students. 3. You have many opportunities. Even if you go to a relatively small community college, there will be resources and classes there that you won’t find at a four year school. Most community colleges have at least a few technical career programs. A lot of those aren’t offered at a state or private university. You might find that you are really interested in cosmotology or radiological imaging. You (probably) won’t be able to study trades like that at a four year school. 4. You can earn *a* degree quicker. Since graduates of a community college earn associates degrees, they usually take two years of full time study to complete: half the time it takes to earn a bachelors degree. Now, associates degrees rarely receive the same prestige as bachelors, but if something comes up that derails your plans of finishing a bachelor program, you still have that associates to fall back on. It shows that you started and finished something. Basically, it looks better than simply a couple years of college. 5. You can find out what you really want to do. It is really hard for most people to know what they want to do when they haven’t had the chance to experience college first hand. It might take a semester or two of exploring your interests to figure out what you really want to spend the bulk of your waking hours doing. Remember, these are just my opinions and based off of my own experience in community college. There is nothing wrong with going straight to a four year university if that is what you know you want. 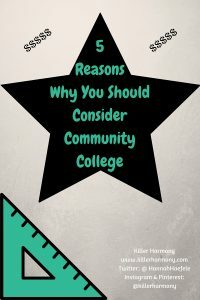 I wrote this post so that people who are still weighing their options have somewhere to go to learn about community college from someone who has been there done that. One of my favorite tools for organization is definitely my life binder. I of course have my handy dandy Erin Condren Life Planner for daily, weekly, and monthly planning as well as different folders and notebooks to keep school stuff organized. But, it is my life binder that holds important things that I need to keep on file. It is pretty simple to DIY your own life binder, and I am going to tell you what I put in mine and why/how to create one for yourself. What is a life binder? Well, it is a binder where you can store important, usually long term or recurring information. I have everything from legal documents to health documents to a sheet outlining my degree program. The nice thing about these binders is that they can be completely customized to your needs and wants. What do you have in yours? Since I have quite a few personal documents in my life binder, I am not going to actually show you what is in mine, but I will tell you how I organized it and what goes in there. In my life binder, I have the following sections: Personal, Health, School, and Other. In the personal section, I have personal things. That could mean legal stuff or a long term calendar, or important contact details. In the health section, I put anything that is related to my health. Any receipts from doctors’ visits, prescription receipts, handouts regarding health conditions, doctors notes, it all goes in the binder under “Health”. In the School section, I keep any important stuff regarding school that does not go under a specific class. This means letters of admission that I received, scholarship information, an unofficial copy of my transcript, a degree outline, and then I also keep things related to enrollment in that section. Why do I need a life binder? If you are in college or even nearing the end of high school, it is a good idea to have one central place where you can go to look for important documents. If you are not living at home with your parents or you will be moving out soon, you want to have an organization system in place for your own use. It does not take much time or money to set one up, and the time and money you spend doing it now will save you from a lot of hassle later on. How do I make my own life binder? It is really cheap and quick to get started. I would recommend first gathering everything that you think might fit in your life binder. Most things would fit there, but just give yourself something to start with. Then, categorize the documents and information you have and put them in different piles. This will help you figure out what sections you will need. Then it is time to gather your materials. I use a one inch binder, but the size will vary based on how much you will be keeping in there. I think one inch is a good starting point. You will also need dividers or tabs of some sort to keep your sections separated. At this point, decide if you would rather hole punch everything or if you want to use sheet protectors. I, personally, prefer sheet protectors so that things don’t get ruined or fall out. Also, if I need to turn something in, say to financial aid, then I have a nice clean copy that has not been tampered with. Once you have all of your materials, it is time to start putting everything in your life binder. If you have a calendar or planning section, I would suggest that that is the first section, because you will probably be referencing it often. Although, it is totally up to you on how you decide to organize it. There you have it! Why you need a life binder and how to create one. As you get older, it is very important to start doing as much for yourself as you can so that you can have an easier transition to adulthood. I have always been an independent person, and so I know this helps other people like me. If you are less independent, it can give you a little sense of freedom and control over your life to have something like a binder to keep everything organized. 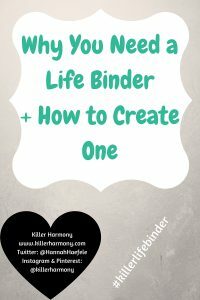 If you make a life binder or you have one already, be sure to post it on Twitter or Instagram and tag me Twitter: (at)hannahhaefele Intsagram; (at)killerharmony and use the hashtag #killerlifebinder!